Property 30: Unforgettable holidays on the Baltic Sea in the "Bornhaus"
Family friendly bungalow in a quiet atmosphere near the Baltic Sea with KAMIN! 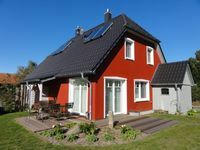 Property 39: Family friendly bungalow in a quiet atmosphere near the Baltic Sea with KAMIN! Property 40: Sunny holiday home with cozy sleeping loft, idyllic location in the garden. 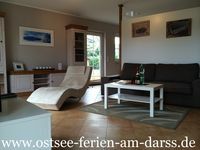 Property 49: Quiet on the edge of a forest cottage is located on Darß - your holiday on the Baltic Sea. Super gepflegte Ferienwohnung, in der man sich auch wegen des Willkommensgrusses gleich wohl gef&uuml;hlt hat. Von Pruchten aus, sind alle Orte gut erreichbar und man spart sich die Kurtaxe. Doe Verwaltung vor Ort Fa Klose war super. Danke f&uuml;r das Besorgen von Salz! Wir k&ouml;nne die Wohnung nur weiterempfehlen.